Even folks who don’t imbibe much tend to do so in airports. I’m not sure if that’s to help quell the fear of flying, or just to relieve some of the tedium of modern-day air travel. What I do know is that obtaining a good glass of wine or craft beer recently got a whole lot easier at the Salt Lake City International Airport, thanks to the opening of Vino Volo Ale House, located in Terminal 2. I’m a big fan of Vino Volo, a wine bar and cafe located in airports around the country—and, increasingly, in neighborhoods, too (no boarding pass required). 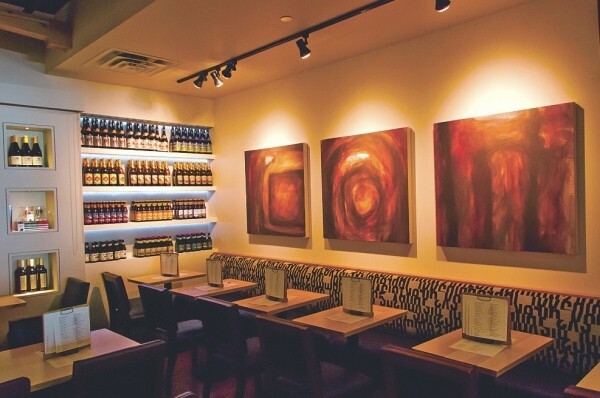 Each Vino Volo combines a wine bar, restaurant and boutique wine shop, where you can purchase bottles of wine to go. I’m told that takeout sales at Vino Volo go through the roof on holidays such as Thanksgiving, when many wine stores are closed and people traveling home for the holidays want to grab a bottle or two to bring with them to dinner. The Vino Volo Ale House in Salt Lake City is unique. It combines Vino Volo with locally owned Squatters—the best of both beer and wine worlds. Although Vino Volo Ale House is operated by Squatters, beer offerings also includes suds from Wasatch Beers, Desert Edge Brewery, Bohemian Brewery, Red Rock Brewing Co., Uinta Brewing, Shades of Pale Brewing and even, due to customer demand (there’s no accounting for taste), Coors Light. Along with seasonal draft beers like Squatters’ Full Suspension Pale Ale, Wasatch’s Raspberry Wheat Hefeweizen, Bohemian’s Viennese Lager and others, the Ale House also offers a number of full-strength and large-format beers. Among those are Uinta’s Cockeyed Cooper Bourbon Barrel Barley Wine, Squatters’ Outer Darkness Imperial Stout, Elephino Double IPA from Red Rock Brewing, Wasatch’s Devastator Double Bock Ale and more. It’s like having a dedicated brewpub right in the airport. At Vino Volo, wines are available by the glass, by the bottle or as tasting flights of two or three wines. The wine list is divided into categories like Daring & Different, Rosés are Red, Shades of White, World Value Reds and California Kings. There’s also a premium-priced wine category called the Sommelier Series. On my most recent trip to Vino Volo, the Sommelier Series included Cabernet Sauvignon from Parallel Winery ($23 per glass) and Andrea Costanti Brunello di Montalcino ($31 per glass). Those offering are a bit rich for my budget, but I found Castillo de Monjardin Garnacha from Spain very tasty at $9 per glass. Vino Volo manager Larry Pontarelli runs a tight ship, and service from staff members like Josh is top-notch. Along with an eclectic selection of wines, there’s an appealing small-plates food menu, too, which includes breakfast. Interestingly, since Vino Volo is located at the airport—where the regular rules don’t apply—you can actually get an alcoholic beverage as early as 8 a.m. So, maybe you’d enjoy a glass of New Zealand’s Seven Terraces Pinot Noir ($12 per glass) with your smoked-salmon bagel, adorned with capers, minced red onion and cream cheese ($8). The pear & Brie salad with pear slices, Brie cheese, candied pecans, dried cranberries and Champagne vinaigrette pairs nicely with Lincourt Chardonnay ($14 per glass), while my favorite Vino Volo combo is the seared-ahi-tuna salad and a glass of Viña Leyda CarmenÃ¨re ($11) from Chile. The smokiness of the CarmenÃ¨re plays off the chili-rubbed ahi and the ginger-soy vinaigrette very well. Thanks to Vino Volo Ale House and other new airport dining and drink options, killing time there is a lot more fun than it once was. Now, if only Popeyes served wine or beer.